TV presenters Ant McPartlin and Dec Donnelly have won a record three prizes at the second UK Nickelodeon Kids' Choice Awards at London's ExCel Arena. The duo triumphed in the favourite funny person category and scooped the award for best TV presenters. 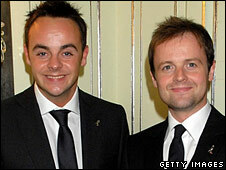 They also picked up the gong for best family TV show, Britain's Got Talent. Simon Cowell was voted favourite TV baddie, the same award he picked up at the US version of the awards show, earlier this year. Team GB were also winners, collecting the prestigious hero award, following their medal haul at this year's Olympics in Beijing, China. Double gold medal winning cyclist, Rebecca Romero, picked up the award with fellow gold medallist, boxer James De Gale and silver medal winning triple jumper Phillips Idowu. Host Dannii Minogue took being slimed on stage in good spirits. "I enjoyed every second of my time as the 'High Priestess of Slime', but nobody told me I'd go home wearing it," she said. Last year's X Factor runners up, Same Difference, presented George Sampson with the best winner prize. He won the ITV show Britain's Got Talent with his break dancing routine. Animated series SpongeBob SquarePants was awarded the prize for favourite cartoon and Drake & Josh took best children's show. For the second year running McFly picked up favourite band and also performed their new single, Lies, at the ceremony. Chris Brown took the gong for best singer, beating Duffy and Leona Lewis. Wall-E won favourite animated film and Indiana Jones was voted best movie. Teenage star Miley Cyrus beat Doctor Who actresses Catherine Tate and Freema Agyeman to the prize for favourite female TV star. Josh Peck, star of Drake and Josh, took the male version of the same award. The ceremony will be broadcast on Nickelodeon on 20 September at 1100 BST.